Not just in the United States, but throughout the world, there are so many people who follow others through blind allegiance. It is rather frightening to observe. All one has to do is to just sit back and take in what is going on around them. We can of course see this in communist run countries where the leaders demand complete control over all the citizens. Yes, I know that these leaders make many claims, but at the end of the day, the people of their countries are not free to live their life in the way that they feel is best. No matter how you slice it, portray it, or rule it, when one takes control of others, then those people are not free. In the United States, we are not a communist controlled country, but our political and wealthy leaders of the day make sure they control us. Yet, it does not stop there. For everyone who feels that we must only believe and worship God in the manner that the religious "pharisees" do, it limits the freedoms of everyone. In addition, you have the people who feel that we should control the actions of almost everything that is done these days in people's lives. It almost becomes like an over protecting and over bearing parent with their child concept. I finally was able to get this CD transferred on to my iphone so I could hook it up to my headphones and listen to it. For some reason, the headphones really amplify the effects for me of audio files, most likely because they help block out the world around me. I feel like I'm in my own little section of outer space when I listen to things through them. 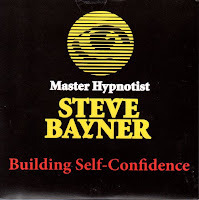 This CD, Building Self Confidence, is one that I got through a hypnotist by the name of Steve Bayner. He performed at the Volusia County Fair in November 2011. I was intrigued by him and when he took the audience through the warm up exercise to see who might be a good candidate to come up on stage, I ended up being one of those people. I'm still surprised that I had the courage to go up on stage because I usually shy away from anything that is in front of people. Self confidence is one of those parts of my life that was desecrated many years ago. Throughout the night, I had such an amazing connection to the hypnotherapy. 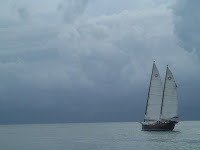 It was the first time that I experienced it and the level of deep relaxation I experienced was phenomenal. After all, while I have a fuzzy memory of the experience, I know that I went out deep. After it was over, it took me some time to really come back to in alertness. Normally in a big crowd of people such as was present that night, I would have been very agitated. Instead, I found myself amazingly calm and enjoying all the people around me. This experience did have a great impact on me. One of the quotes that I love from the book, You Are The Answer by Michael Tamura, is on page 42. It is a quote that says so much about our consciousness and awareness of our role within our body. It wasn't until a few years ago when I began my intense healing work with Dr. Paul Canali, that I began to understand what this means. To many of us humans or maybe a majority, go through life with no or very little connection to the body. The mind body connection is a buzzword that is thrown around without very little understanding. Many in the modern day new age movement give lip service to this concept while hiding from their true and authentic selves in the fears of the mind and body. As you become more conscious of shaping your immortal body, you will come to know that every part, every organ, indeed every cell of your physical body reflects a divine ideal, experience and meaning. It is the dynamic aspect of God - what Christians call the Holy Spirit - that incarnates as each cell and forms the template for our immortal body. 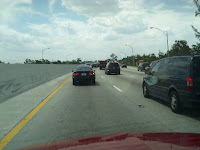 All too often, we go through our days in a hurried fashion full of one task after another to complete. We've just gone through the hectic holiday season and most likely, we failed to stop, drop and connect with our body. It really isn't that hard to do, but if you aren't in the awareness of it, than it appears most difficult. Just by allowing yourself to stop, drop and connect, you will give yourself a much needed energy boost for your day. You'll connect into that inner power that is often neglected and you'll approach the place of inner peace that most of us could use in a day. There are many more benefits to practicing awareness each day of our life, but the only way you will realize them is through stopping, dropping and connecting. Here is an exercise that you can do to help you stop, drop and connect. Take a moment right now where you are at and just sit back in your chair. You might close your eyes if you can for a moment (unless the boss is watching). Now just place your hands on your stomach. Allow yourself to begin feeling your hands on your stomach. You might ask yourself, what does this feel like? Are my hands warm or cold? Are they soft or rigid? What is the weight of my hands on my stomach? Can I even really feel my hands there or not? How does that make you feel as you touch your stomach? A good friend of mine, Donald D'Haene had one of his articles published in the London Free Times of Canada. The title of the article was Reaching Out To Lost Brother At Christmas. Reading Donald D'Haene's book and meeting him at the taping of the Oprah 200 Men show in 2010, I am well acquainted with his story. In many ways, it matches up to what I experience in my own life. No matter what you do, it is difficult when you are disconnected from family. It is never easy no matter how many happy smiles you put on it or how many different ways you look at it. It is something that you learn to live with in your life. In my case, I chose to cut the connection to my family because it became to painful and toxic. In many ways though, they cut off the connection as well unless I came around to silencing myself. It was the only way I could survive in the early 90's. In order to begin finding myself, I had to cut the connection of the past. It was one of the most difficult things I have ever had to do and even was much more difficult than learning how to walk again after my paralysis. Even in the midst of all the magic of Christmas, it can be a difficult time for many of us. I am one of those people and if you have been reading my blog the past few days, you will readily see what I mean. However, each year that goes by, I heal a little more and the pain of the season lessens. This year, I have been focusing more on very deep relaxation where I connect deeply with my body. Even though my pulse rate has still gotten up in the high 90 range, I have been able to drop it significantly if even for a temporary moment during the day. 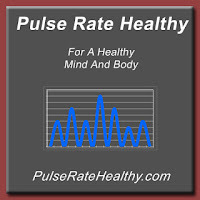 The details of what I am referring to can be found on the blog of another site I manage called "Pulse Rate Healthy". Please click the following link to read more about my Christmas Pulse Rate and check out my pulse rate log that can be accessed from that site. Even though many people see Christmas as a magical season where family and friends unite, in all reality the stress of this time is far greater than anyone will admit. We think of the Norman Rockwell setting and look forward to traveling home to be with our loved ones. Yet, the struggle of the season is alive and well inside many people. We spend countless hours in the stores trying to get the best bargains on all the presents we can buy. We spend untold dollars to get those expensive electronic gadgets including the electronic games, iphones, ipods, ipads, androids, computers and everything else. No dollar amount is too large and no difficulty too great as we attempt to brave the crowds, use our pepper spray, and trample others in the dash to get what is ours. After all, we must have those gifts. The news media comes along and fights over who is putting Christ in Christmas and who is not. They declare a war on Christmas and vow that the a segment of our population is taking over the season and pushing us into the dark ages. As this discussion continues, the same news media outlets pad their pockets with advertisement dollars promoting the commercialism of the season they so detest. The viewers of said programs watch and gulp it all down as if nothing else matters. No matter how hard I try during this time of year, I still succumb to the pain, anxiety and despair of this season. I so badly want to find a way through this rather than face the anxiety, nervousness, stress and tension that I feel.. I want to feel the joy of a child on Christmas morning rather than the anger that bubbles up within me and forces me to hibernate from the outside world during this season. I don't want to feel lifeless and drained as I try to cope with the mixed emotions and pain. I would love to believe that I could wave a majic wand and it would all be a normal and fun and exicting time of year. However, I would not be living in reality if this were true. Each year, I keep trying and hoping that somehow this year will be different for me. In fact, I can see that things have changed and I am growing through some of the hurts. Yet, as the days get closer to Chrsitmas, my body physically changes as if someone places a thousand pound weight on my shoulders to carry around. I fight to flee this yearly ritual, but I am not able to run fast enough. So, each year I try to do something at Christmas time and I have learned that if I don't do this early in the month of December, that by the middle of the month, I literally have no energy left to carry it out. Yes, Christmas was full of joy when I was a child, but that is only half of the story. Christmas morning was one day that I looked to with anticipation, but also dread. You see, most of my family were not grateful for presents they would receive. I always gave something from my heart that matched something that I thought would be special to them and usually it was done on very few dollars that I had to my name. Sometimes I would create something deep from my heart and give to them. The only thing is that all too often I heard the disappointment they had as "this was all they got" type of attitude filled the room. If it didn't meet their expectations, you would know about it and my heart got broken many times. One example of this was when I was in college and struggling to make it through school and pay bills. I had no help from home and had to pay for college completely on my own. I saved my pennies all year long to buy Christmas presents and managed to have $5 a piece to spend on them. I carefully took the money and tried to buy as much as I could of things that I thought they would use and like. On Christmas day, I heard comments like "this is all I got and we spent more on him then he did on us". It broke my heart and it hurt because I had taken everything I had to buy them these things and I had put so much thought into it. After all, I could have bought a months' worth of food with that money but I chose to give. Of course, that was not the only time I had heard these words, or would it be the last. I'm amazed at my age that I still get as excited about Christmas as I do. I would think that after all these years, it would start to wane. Even though there isn't the celebration these days, because quite frankly it sometimes hurts too much, I still find myself getting just as excited as I once did when I was a child. The joy on Christmas morning was something I waited all month for and even though our home life was in constant turmoil, this was the day of the year that offered an escape. It was the one day of the year that Santa would come and give us presents and life would be more peaceful for a few hours. Granted, I realize that we got very few things, but honestly I did not care if someone would have wrapped empty boxes and gave them to me. I just wanted to see wrapped presents under the tree. I was mesmerized by the pretty colorful wrapping paper, the shiny sparkling lights and ornaments on the tree. The smells of cookies baking and candy being made by my mom, to the frosting of cookies, it was a special time of year in our house. I always enjoyed it when we would frost the Christmas cookies and surprise some lucky recipient. It warmed my heart with joy. My mom would go all out making peanut brittle, divinity, fudge, cookies of every kind, and especially the cutout cookies we would frost together. Imagine a glass full of water sitting on a table. If you try to add more water to it, it will over flow. 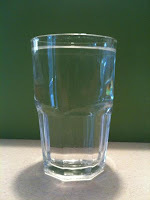 If you try to add the water all at once, most likely you will splash some of the original water leaving you with less water in the glass then before. However, if you want to add additional water to the glass, you need to drink some first. Now imagine your body as the glass and you are trying to relax. Relaxation is the water and so if you're nervous system is revved up too much, (or the glass is too full), it will be difficult to add much relaxation to your body or to feel relaxed. Yes, you might do some relaxing things or enjoy some body work that is relaxing but the capacity for you to take it all in, is limited. In order for you to replace the tension or stress in the body with relaxation, you will need to remove some of it first. Once you remove it or release the tension and stress from the body, you have the opportunity for greater relaxation and peace. Unfortunately, too many body workers, healers, and massage therapists, focus on putting more relaxation into a body that has no capacity to take it in. In fact, many people out there going for treatment are looking for the quick and easy fix to relaxation, rather than creating greater capacity within their body for this. While limited results may occur, the person being treated only gets so much benefit from the treatment. Many modalities and healers claim that they just allow whatever to happen that needs to happen. There is much truth to this, but there is also a blind spot in the mirror. At one time, my pulse rate would stay up around 99 and no matter what I did, it would not come down to a healthy pulse rate. After some intense healing work that allowed me to release some physical trauma stored within my body, my pulse rate started to drop. Most of the time, it is around the 70's to the 80's and I can live with that. Occasionally, I drop down into the 60's. The pulse rate I am referring to is my resting pulse rate or also known as a resting heart rate. Because of the Christmas season, I've been experiencing a great deal of stress as is normal for me. The past pains catch up with me this time of year and although it is not as bad this year, I still feel the effects. Generally, the day after Christmas, it is like my body has been reborn again and the stresses that I felt for days before have mostly vanished. The after affects though, sometimes linger around for days. Do you ever stop to really think about life? Do you ever stop to wonder why you do what you do in life? I know philosophers ponder these things. All too often everyone tries to avoid these type of people because the concepts are not what they wish to embrace. It is easier to not think about such things in life, rather than to dig deeper into our humanness. So much of what we do in a day or in a moment was formed early on in life. In fact, some research suggests that it may have started in the womb. We learn so much from our caretakers and their messages in life become our messages that we live by in our own life. No one stops to think of just how much we were influenced by those early days and what we found comforting versus what we learned to fear. We carry our early days on into our school days and as we grow, we learn to follow additional unwritten rules of society. Our minds are taught things to embrace and things to fear. As each of us wonders why you do what you do, we realize that our teachers have taught us good and bad, according to their own level of consciousness and growth in this world. I get more and more amazed these days at the collective unconsciousness of our country from the religious to the political to the medical and new age establishments. It almost feels like we are in a big shift but instead of moving forward, we've hit the gas pedal in reverse. People seem to follow whatever is thrown before them these days. As they are fed morsels of words, phrases and opinions, everyone assumes these are the facts that prove a point or disprove other points. Polls are randomly conducted and so dis-configured that they hold little meaning. Yet, opinions, polls and pundits rule our day in dishing out the perceived facts to live by in our life. No one appears to use common sense these days. Common sense seems to have vanished from thin air. It is replaced by a gullible acceptance of whatever is being said on that day by whoever people are listening to in that moment. No one stops to question any of it or if they do, their minds cannot comprehend the morsels of truth that float in and out of our collective unconsciousness. Recently on CNN, Dr. Drew was interviewing Tom Arnold and Dr. Allan Schore (a Neuroscientist) about the Sandusky child abuse and molestation story. In the following video clip of the show, some very important points were made. Often many survivors ask the continual question of why didn't I speak out and tell someone about the abuse or why didn't I scream. Outside of the fact, that survivors are viewing the situation through an adult mind, there is a more relevant reason. When we are faced with traumatic situations as children, our minds are not able to handle these things and trauma induces a freeze response. We all know that when you are confronted with a fearful situation that there is the flight or fight response. However, as a child when you are overpowered by an adult, the fight response is most likely not the one you will gravitate towards. After all, how can a little child have the strength to stand up to someone much bigger then they are? In the eyes of a child, an adult is the same as a giant. The alternative is to flee, but that does not mean you are running from the situation. Often it means that you endure the situation, but your mind and body check out because there is no way to run away from the person doing these things to you. Even though it is Christmas and the time to make and send your Christmas list to Santa, this is not a time to confuse the practice with abundance or the law of attraction. Abundance is not about making a list of things you want and then expecting the universe to have them show up in your front yard. I'm always amazed at the way people view abundance, even the people who teach these concepts for mega millions. Even in the midst of conversations with people solely focused on abundance, they will claim that they do not equate abundance with a Christmas list, but yet they will turn around and teach this very same thing. It is sad because as I have stated previously, abundance is about so much more than making a list and waiting for it to happen. It truly is much more. Abundance is a state of being or a state of where you are at in your mind. It is aligning yourself up with your true purpose for your life and becoming aware and conscious of what that is. It is not about making a list of things that you feel you need, want or desire and then offering it up to the universe (or some higher power or God) and expecting the Fedex truck to deliver it to you. Sorry, if I'm blowing your bubble, but we need to really be honest with the law of attraction and abundance. This was a journal entry written around the time of the itchy rash that I recently went through. While I have moved on from that moment and my hand is fully healed, I thought this was too good to not post up on the blog. It depicts the difficult moments and the struggle to hang on, stay focused as our body heals. Tough moment to stay focused. It's so easy easy to lose site of the excitement of steps ahead. Maintaining the gratitude and love for what is possible feels harder than expected. I'm a tough cookie, but sometimes I struggle to find the energy to stay tough or full of courage and strength. Finding the balance of just allowing life to unfold, but not giving into the forces that desire to see me fail is extremely delicate. Each day I continue my steps forward. Each day I fight the forces of fear that wage a war against me. Some days I feel like I have advanced and other days it seems as if my communication with battlefield command is full of static. Regardless, I offer up all of these thoughts, words, and feelings of fear. I send out love to these areas of my life so they may heal and grow. I ask that my focus remain steadfast so that the winds of the moment not sway me from my path. In the end, I will come to know that this too shall pass. If you would have told me at one time, that going through a crises would be something to wake me up, I probably would have knocked you to the ground. My life, like many others, has had some serious things to overcome. None of these events have been the easiest to deal with or experience. Yet, I am beginning to learn that instead of fearing and hating every part of what has happened to me, if I begin to look at these moments without darkened lenses, I see a much different picture. They truly are there for me to help me grow and find my way on my own path. Even as I write these words, I still fully know how difficult it is to comprehend and own this awareness. Imagine for a moment if you are walking along a mountain path. If the path was straight and level for a distance, you might get so caught up in the view, that you forget to watch out for your path and where you are walking. However, if there was a rock in your path that you stepped on, your leg and foot might twist a little. As your leg begins to twist, your eyes go from the scenery back down to the path in front of you so you can find your footing. Consider that the rock is the crisis in life and that by stepping on the rock, you are once again focused on your path ahead. Now, while you are immersed in the beauty of the mountain scenery, you have your eyes focused on the path ahead. The rocks help keep you from falling off the mountain. Recently, I was made aware of this video on YouTube where Zach Wahls speaks to the Iowa House Of Representatives. While I try my hardest to stay away from politics on this blog, I feel this is more than just about politics. It has a very good message that needs to be shared with the world. Zach Wahls did an excellent job of communicating some important truths about family. Please go to the following video and really listen to what he is saying. Unfortunately, this is a reality that many people in our country and world have to face each day. In the video, Zach is eloquently speaking about growing up in a family with two lesbians and how well he turned out, how proud he is of his two moms, and just how successful he is in life. It brings this struggle home front and center, although the politicians did not listen to a word he spoke. Please share the following video with your friends and through Facebook, Twitter or other sites you have access to. This message needs to be heard. Sometimes it is easy to question if we are truly connected to life or if life is connected to us. There are so many abundance courses on the internet and new age gurus trying to convince everyone that you need to spend thousands of dollars to get somewhere in life. While I know people purport to have stories that prove the validity of these things, I remain in question as to these "products" being the best thing since sliced bread. In the book, You Are The Answer by Miachel Tamura, he states the following which I believe is a core truth of being connected to life in an abundant way. Page 49 - Life is always there, giving; the only question is whether we are there to share in it. At this stage of fulfilling our soul purpose, our needs become the needs of fulfilling life’s own purpose instead of our personal needs. We begin to realize that, if we ask life to provide us with what we need to fulfill life’s purpose, it will provide us first with all that we need personally. After all, if we don’t survive, we wouldn’t be able to fulfill any other purpose, would we? 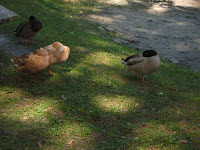 The University of Florida in Gainesville has been researching how the human voice changes in major ways under stress. While we may all suspect this or know this, the research is reported as a major break through, as one day it could be used to detect deception. 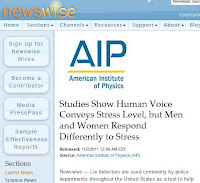 One surprise though in the research was that men and women respond differently to the same stressors. Originally, they were not going to test for differences between men and women, but decided to analyze the results separately. The expectation of the researchers before the study was that the results would be about the same between men and women. The study used people from the community or local religious groups who were strongly associated with a group identity. Statements that were deceptive and truth based were recorded and used along with a threat that the results would be shown to fellow participants for judgement. Electric shock was also used to increase the stress load. Some days it is easier to become overwhelmed by all the experiences I have encountered in life. I am certain others could say the same. Yet, I realize that these circumstances or experiences give us the opportunity to become more acquainted with our authentic self. It is easy to look at our day through the eyes of despair, knowing that life is difficult. No one could blame us at times because there are many that would not have enough courage to walk these paths. As much as this is true and valid, there is another way to our journey through life. For a long time, I struggled to begin forgiving those who had harmed me. Of course, I had every right to feel the way I did, because I was deeply hurt and those feelings helped me find healing. It was not until I began to replace a word that has haunted me, with a higher concept that makes more sense to me personally. The word forgiveness is a haunting word and has so many negative connotations and meanings to me, because of my life's experiences. Sometimes the courage to keep going is not a loud boisterous thunder from the tallest mountain. Often courage is the tiny little voice in the corner that says, I will try again. When we face a night of despair, sometimes being silent is all we need to listen to that quiet voice within us. Sometimes just focusing on trying one more time is the kinetic energy to find our way through the night of despair. It is in these moments that everything looks bleak, where we will find out way forward. If you are backed up against a wall, the only direction you can go is forward. In these moments, keep an eye open for courage because most likely it will be standing right behind you. Courage will be waiting for your embrace to push you forward on your path. One of the things I love so much about Christmas is the music. Whether it is the Christmas Carols that we sing or holiday music playing on the radio, there is something pleasant and peaceful about these songs. These songs bring back some wonderful moments from my childhood. They transcend me from problems in this world to a magical time of hope and possibility. I was often playing the piano during Christmas programs at church or for the high school choir. It was always a fun time for me and of all the music that I performed publicly, holiday music was what I most enjoyed. Playing Christmas carols music in nursing homes or hospitals on the piano, often made the residents and patients gleam with joy. It warmed my heart as well with peace and love. In 2007, I created a video of an in-home Christmas concert. 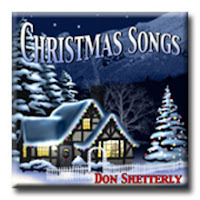 The song that is playing on this YouTube Video is the Christmas Medley from my CD, Christmas Songs. It is one of my favorites. The songs that make up the Christmas Medley are The First Noel (Nowell), Angels From The Realms Of Glory, and Away In A Manger. The entire video is around 5:24 minutes in length.  To date, it has had over 24,000 views. Some people has asked how I put these songs together in the flowing manner that I do and to be honest, I have no idea how to explain this concept. I learned a long time ago when I was playing for churches, how to flow one song to the next. It is one of those talents that I have and it is what you see coming through in this medley. Most of the time, the songs flow together naturally and I do not give it any thought. Usually, they just happen. All too often in a day, I see in our society and even throughout the world, humans finding some entity to blame. Everyone wants to blame someone or blame anyone, but they never look at the any part of their own life that could be a contributor. Often, humans do not even realize that they are doing this or that they are part of the collective energy of blame. It's easy to focus on the person making the accusation or the person that was negligent. It's easy to blame the ones that the mob hails in society as the person(s) we should hold as responsible. What is difficult to do every day, is to quit blaming people and start living one's life to the fullest. I do find it amazing that we often blame things that are entities in our country and society, but yet we cannot walk up to these entities and touch them. Even though they exist, they really do not. Take for instance, the economy. It affects every person, but it is made of each person it affects. Yet, instead of taking personal responsibility, we blame the thing that we have all made up and created. The health care industry is another example of this concept. War and the political process are further examples. Christmas can be such a wonderful time of the year. It is filled with anticipation of a magical day to come. The Christmas cookies, the tree, and all the Christmas carols make December a fun-filled month. Of course, we cannot forget the Christmas card. It is a tradition practiced among friends, businesses and organizations. In fact, it is estimated that each household sends out approximately 30 Christmas cards each year, and in the US, over 3 billion are sent through the mail. It is always a pleasure and a joy to receive Christmas cards in the mail. When I get a card in the mail, I tape it to the door frames around our house and it becomes a festive decoration that just adds to the season. However, I'm not as diligent sending them out as some of my friends. Here's an idea that I believe will give you an added bonus when sending out your Christmas cards this year. I'm not sure if you have heard of the Give A Smiley Project, but it is a movement to send out free downloadable smileys in the mail. It is very and easy to do. The purpose is to light up the day of the person receiving the smiley, and by doing so, help change the world one smiley at a time. If you would like to see other book reviews in this series, please check out the blog post on May 4, 2011. On the 5th of every month, I post a new book review (or that is the plan at least) of books that I have been reading. Many months ago, I was browsing through a Barnes And Noble bookstore and came across this book, You Are The Answer. The book was one of those that really caught my attention on the shelf. I purchased the book and added it to my stack of books to read. Finally months later, I began to read it and I am so glad that I did. This book is filled with common sense, down to earth thoughts about how to truly find yourself in life. The subtitle of this book is Discovering And Fulfilling Your Soul's Purpose. I had never heard of Michael Tamura until this point but what he says in this book makes sense. It is written in such a plain language and with easy concepts so you really get what he is talking about in the book. Some of my favorite sections in the book include some of the following pages. In the movie, Religulous, Dr. Andrew Newberg was interviewed on his work in Neurotheology. He studies show how religious experiences and practices impact the brain by doing brain scans of various religious people. Gone are the days that we have to guess about what happens in a person when we can see it first hand through a brain scan. This field of study is called neurotheology detailed in a book called "Principles of Neurotheology". While people are in a very deep spiritual or religious state, these researchers do brain scans. Some of the people they have studied include a Buddhist meditating, Sikhs chanting, and nuns praying. They compare these brain scans to that of the person at a state of rest and observe the difference. This research has given them a big opportunity to really see what happens within the mind and body when someone is taking part in a religious or spiritual practice. In the movie, I Am, produced by Tom Shadyack, the HeartMath Institute was one of the featured organizations in the film. They are doing some wonderful research in the area of the heart and the connection to our mind. There is a great deal we do not understand about our heart and the mind body connection. I am happy to see an institute like this focus time, energy, and money on this part of our human existence. In a recent study, the HeartMath Institute found that the heart picks up intuitive information a second or more quicker than the brain. Intuition or a pre-stimulus response can be identified and measured within the body. Using a research method of gambling, one of the points measured was heart rate variability. Heart rate variability is the difference between heart beats. Employing a roulette wheel, the participants were told that they were doing a gambling study and the goal was to win as much money as possible. Deepak Chopra had an excellent article on his website that should be discussed and talked about more in our society. The article, Heart Attack Myths And the Missing X Factor, is one that I feel is a must read. Sometimes I get pretty hard on the medical establishment and I'm sure that I have turned many people off at times with what I write. However, the paradigms that we follow when it comes to healthcare are often not based upon as much truth as we are led to believe. There is a place for modern medicine but I wish that the establishment would dump their paradigms. We would all be better off as a result. In the article, Deepak Chopra makes some very valid points. One such point is that many conditions are hard to treat because people identify with or latch on to the wrong cure. If you need any evidence, look at the explosion of pharmaceutical companies, the dollar amounts we pay for medications and medical care, and then compare it to the overall state of health in our country. If all of these practices worked like they are advertised, we would be much healthier in our country than we are at this point. Our health care costs are skyrocketing and yet we are not making progress when it comes to these health conditions in our society. I was reading "Creating Space For New Yoga Students" by Katie Lamie. In this website article, the author states, "Yoga is an invitation" as she writes to those who are afraid they are not good enough to practice Yoga. I found that to be very insightful, because Yoga is an invitation into the mind body connection. In fact, I got a chuckle out of her when I read that yoga is not a for-flexible-folks-only-club! It is a practice I don't do enough of and often I fail because of some of the same things she talks about in her article. Yet, I know just like she is saying that with a good Yoga teacher, there is a pure place of peace that you can reach. This place of peace is because we have allowed our mind and body to connect. Unfortunately, the only place I can currently experience Yoga is through the LA Fitness center that I belong to in my area. While it is Yoga, they rush it through like it is an exercise class and they miss a major part of Yoga's benefit. Of course, LA Fitness doesn't seem to care because like everything else in this club, the money appears to matter most.